Hobbs Valve aim to be leaders in the design and manufacture of Triple Offset Butterfly Valves and as a result have recently concluded an investigation into which materials were most suitable for our valves in severe applications. A number of ‘hard faced’ test pieces were used in materials common within industry for severe service applications. Amongst which were Titanium Nitride and industry standard Stellite 6. The tests were performed under laboratory conditions at Cranfield University. To identify suitable coatings which can be applied to the sealing surfaces of a Triple Offset Butterfly Valve. To identify the most common wear mechanisms which a Triple Offset Butterfly Valve may encounter. To perform ‘wear’ tests on a series of coatings to identify the most effective coating. 2 types of testing were carried out; Erosion testing and Abrasion testing. The primary mechanisms of wear that are likely to occur during the lifetime of a valve are erosion by solid particle impact and low stress three body abrasion. Tests conducted at room temperature. The erosion rate was calculated for each specimen as a mass loss per mass of erodent impacting the specimen. The wear rate was calculated for each specimen as a mass loss per wear distance travelled. Hobbs found that TiN (Titanium Nitride) achieved the greatest results under both the erosion and abrasion wear mechanisms. 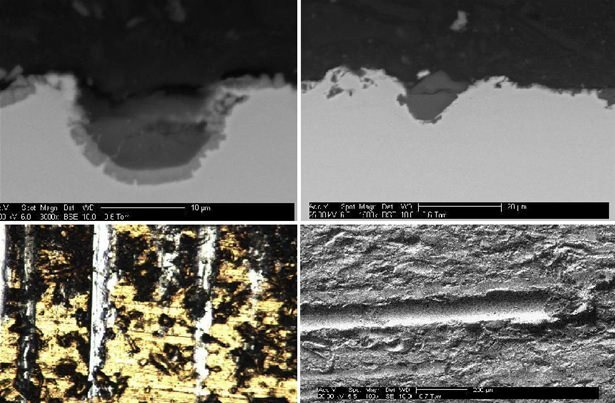 It was found the substrate has a large influence on the coating ability to resist wear and it was found the rate of erosion is directly related to particle velocity. The TOV industry standard is to use a Stellite 6 coating on sealing components to prolong the life of a valve; this weld overlay process is time consuming and costly to apply and machine. When the valve is open these sealing components are exposed to full flow path of the media. Our investigation clearly indicates that in such environments Stellite is not the best option when prolonging the life of your valve; it can wear quickly and might lead to valve leakages and premature failure. TiN coatings do not incur significant additional costs to the end-user, and it is a much more durable coating to use in severe applications. Based on these findings, when asked to supply into severe applications, Hobbs Valve use TiN as standard in their range of Triple Offset Valves. Please contact the Sales team on sales@hobbsvalve.com for further information on how we can help you with your severe service requirements.